Rosa Bouglione, who still lives in Paris, was born Rosalie van Been in 1910 in Ixelles, Belgium. Her parents owned a small circus and menagerie, which toured in the Netherlands, Belgium, and France. In the family circus, she performed as a dancer amidst a group of lions. In 1928, she married Joseph Bouglione (1904-1987), who belonged to the third generation of a family of animal trainers who owned a traveling menagerie and entered the circus business in 1924 – which would eventually made them France’s most important and wealthiest circus family. Originally named Buglione, this Sinti family came from Piedmont and travelled in the late nineteenth century between Italy and France. In 1926, Sampion Bouglione and his sons, Alexandre, Joseph, Firmin, and Sampion, Jr., created a fake “Buffalo Bill” Circus that toured for a few years with considerable success and started their fortune. In 1934, they purchased the legendary Cirque d’Hiver (Winter Circus) building in Paris, which had been erected in 1852, and which is still under the family’s management. According to Rosa Bouglione, the circus company was allowed to travel under Nazi occupation, although the management of the Cirque d’Hiver was given for a short time to Paula Busch, the owner of Berlin’s famous Circus Busch – which had been demolished to allow Albert Speers’ redesign of the German capital (including a new Circus Busch), a project that was never realized. As Sinti, the Bougliones indeed resented the Nazi occupation of France but, somehow, they were never suspected by the Germans: their Italian name may have helped dissimulate their true origins. Nevertheless, the Bougliones dared to outwit the German propaganda orders by letting Geo Sandry produce circus pantomimes such as “Robin Hood,” in which he slipped political allusions, mostly conveyed by the clowns Alex et Zavatta: it put several times Rosa’s husband, Joseph Bouglione, and his brothers in danger to be arrested. But this was nothing: the Bougliones also hid Jewish performers in the Cirque d’Hiver (such as the Pauwels family) and, towards the end of the German occupation of Paris, the French Résistance used the circus as a weapon cache. In post-war France, the Cirque d’Hiver successfully continued its long career, and it is still active today under the management of Joseph and Rosa Bouglione’s grandchildren. Rosa Bouglione, whose lifespan has stretched over more than a century and is still alert, is revered as the Grande Dame of the French circus world. Bouglione, Firmin: Le cirque est mon royaume. 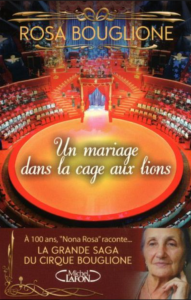 Paris 1968; Bouglione, Rosa: Un mariage dans la cage aux lions. La grande saga du cirque Bouglione. Paris 2011; Gruss- Bouglione, Gipsy: Sur le fil de ma vie. Pont-Saint-Esprit 2005; Aiolfi, Marjorie; Bouglione, Louis Sampion: Le Cirque d’hiver. Paris 2002.